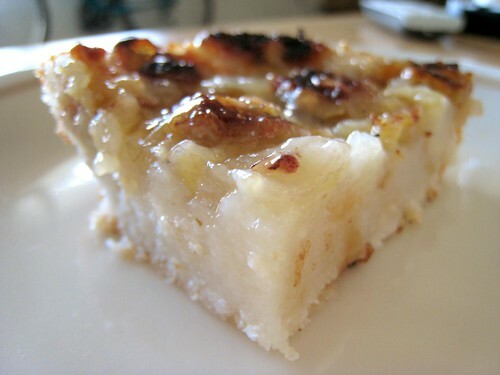 It had landed in my inbox months earlier, courtesy of my brother: "Granny Nguyen's traditional Vietnamese banana cake recipe." 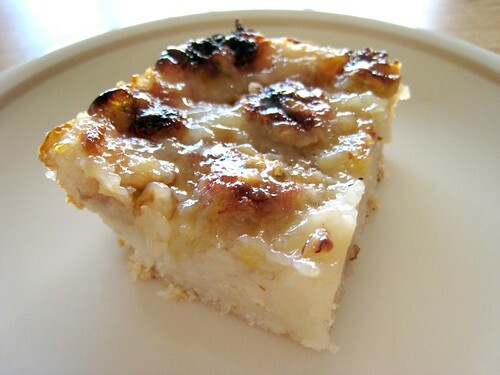 Jeff had eaten the cake at a potluck and requested the recipe from his friend, and it's one that seems to be copyrighted to Hiroko Shimbo at Hiroko's Kitchen. I'm not sure whether that means the recipe is really Japanese instead of Vietnamese, but either way I was willing to give it a shot if my brother was saying that the cake had been delicious. 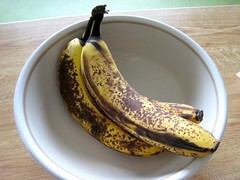 Especially since I had three large overripe bananas on the counter. I was most intrigued by the cake's base of torn French bread and cornstarch batter. 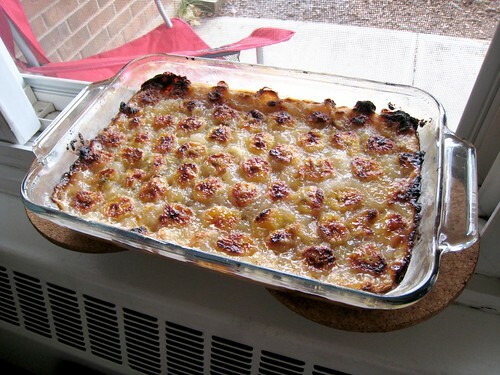 Since I'd never eaten it or even seen what it was supposed to look like, I was envisioning something like a bread pudding beneath a layer of caramelized bananas, maybe with a slightly different texture from the cornstarch and lack of eggs. Instead of French bread I used a few slices of sturdy, crusty bread that were going stale, and I used light coconut milk, too, instead of regular. I also cut the amount of sugar, since my brother had said the cake was quite sweet. Post-bake, and cooling on my "windowsill." Again, this was when I was still struggling with the craziness of my oven, so after an abbreviated baking time of twenty minutes, I had to take the cake out of the oven before the entire thing burnt to a crisp. You can see that the edges are already a little blackened. Frankly, I have no idea if this was how the cake was supposed to turn out. The flavor was good, laced with caramelized banana and coconut flavor, but despite my substantial cutting of the sugar (by about half a cup) it was still extraordinarily sweet. And while the directions said to chill before serving, I found that I liked the cake best when it was still warm: in the refrigerator, the cake turned hard and unpleasant, while when warm it was bouncy and soft. When I ate a slice the next day, I microwaved it first. I'm guessing that if I had been able to bake it at the proper temperature and length of time, it would have come out better. 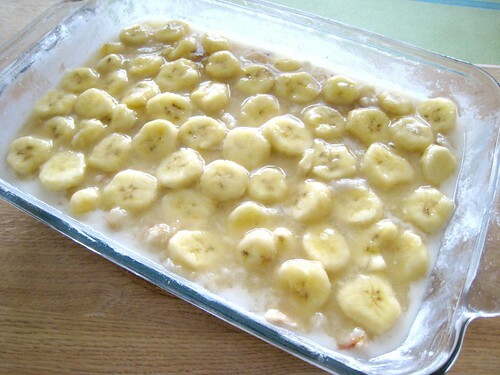 Given another stash of overripe bananas, I might try this recipe again. Heat the oven to 400 degrees F. Grease the inside and bottom of cake mold and line with parchment paper. 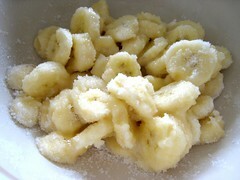 In a bowl mix sliced banana with half amount of sugar. Stir gently with wooden spatula to toss banana with sugar thoroughly. Break French baguette into small pieces by hand and place them in another bowl. Add remaining sugar and coconut milk. 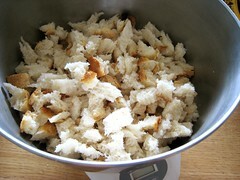 Stir and mix thoroughly until bread is very soft. Add cornstarch. 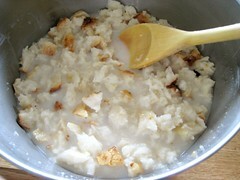 Place bread mixture into the mold. Level the surface and cover it with banana. 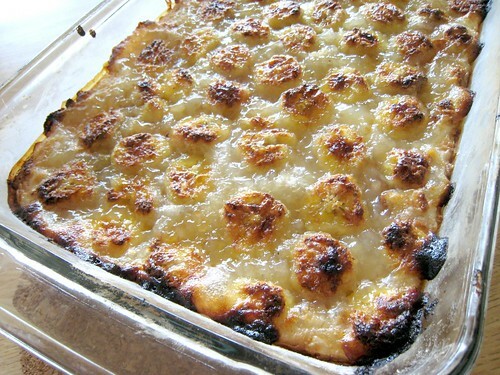 Bake in the heated oven 40 to 50 minutes. Remove cake from the oven, cool and chill in the refrigerator before serving.